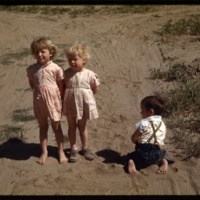 Two girls standing in camp while a small boy plays on the ground. 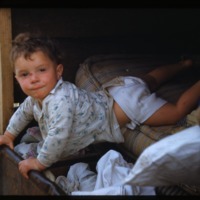 A small child is looking out of the back of a pick-up truck. A garden home with blooming plants around the three-room house. 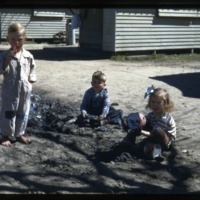 Three children playing in the dirt at the camp. 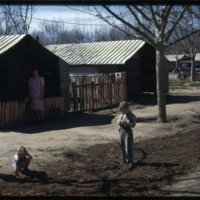 A mother watches her children at play in front of their tin cabin. 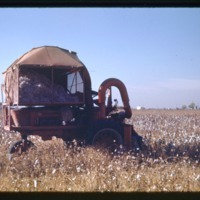 A side view of the Intenational Harvester one-row cotton picker stopped in the cotton field. 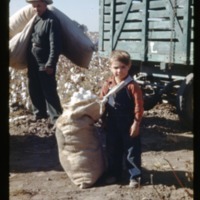 The boy has picked his bag of cotton. 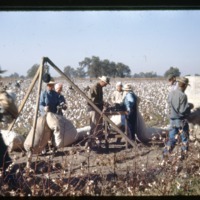 The weigh-in station is busy: one man's bag is being weighed in, another man is waiting in line with a full bag of cotton, while two men walk away with their cotton bag rolled up under their arms. 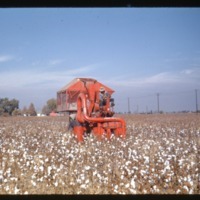 The calculator is operating his machine. 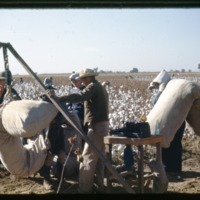 The cotton bag is being weighed in, and the adding machine will be used to print a record for the picker.